Army veteran Nick McCormick takes the first swing at the grand opening of the Potomac Shores Golf Club in Prince William County, Va., on Monday, May 5, 2014. 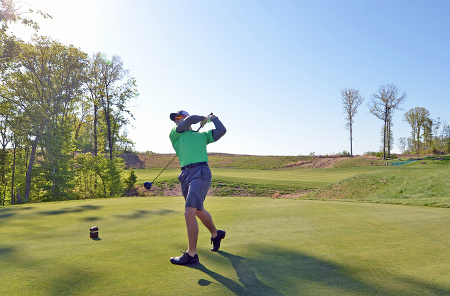 Prince William County, Virginia — On Monday, May 5, the Potomac Shores master-planned community celebrated the grand opening of its 18-hole, par-72 Potomac Shores Golf Club. The first publicly accessible Jack Nicklaus Signature Golf Course in the greater Washington, D.C., region opened to residents and daily-fee guest play. The course features a hardwood forest outline, dramatic vistas, rolling greens, and holes that play along the Potomac River and Powell’s Creek. Located just 30 minutes south of Washington, D.C., Potomac Shores Golf Club is a centerpiece to the Potomac Shores community being developed by SunCal, one of the leading developers of master-planned communities and commercial developments in the United States. The Potomac Shores Golf Club features a new 8,000-square-foot clubhouse, providing the ideal environment for residents and visitors to dine, relax and recap the experience of a picturesque round of golf. Guests will also enjoy the clubhouse’s outdoor ambiance with brick patios overlooking the 18th green, complete with distinctive fireplaces and an outdoor fire pit. Finally, the spacious event lawn provides an ideal venue for tournaments, weddings and other group outings. For tee time information, visit www.potomacshoresgolfclub.com or call 855-808-6051. On Monday, May 5, 2014, the grand opening of the 18-hole, par-72 Potomac Shores Golf Club in Prince William County, Va., was celebrated. Gathered for the opening are (left to right): Chris Brown, assistant golf pro; Todd Van Meer, golf pro; Kristi Santee, administrative assistant; Eddie Byrne, vice president, project management; David McGregor, golf course superintendent; Patrick Boucher, director of club operations; Nick McCormick, Iraq and Afghanistan Veterans of America; and Rick Young, retired FBI staff member. Potomac Shores is the region’s first luxury resort master-planned community. It is situated on 1,920 acres and features nearly two miles of shoreline and a traditional Virginia Tidewater design. The transit-oriented community will offer a town center, marina and waterfront village, future on-site Virginia Railway Express station, corporate campus, private 10,000-square-foot recreation center, two public schools, more than 15 sports fields and courts, walkable neighborhoods, over 3,800 residences and 10 miles of trails. For more information about Potomac Shores, visit www.potomacshores.com. SunCal acquires, entitles and develops major residential properties and commercial developments. The company creates distinctive communities that emphasize quality of life, environmental sensitivity and recreational opportunities. SunCal is one of the largest real estate development companies in the U.S. that specializes in large-scale, mixed-use master-planned communities, and has offices in Irvine, Calif.; Northern California; New York City; Washington, D.C.; Las Vegas; Denver; Austin, Texas; Savannah, Ga.; and Melbourne, Fla. For more information, visit www.suncal.com.